Feel free to contact your Congressional Legislators in Washington, and let them know that TPP and TTIP Fast Track Trade Authority is unconstitutional at best and treason at worst. They vote this week, and it looks like Congress under the radar pretty much, is going to vote for it, because every one who does, knows they will be richly rewarded, never mind apparently, they sold out the sovereignty of America and Americans, to elite foreign and domestic interests. For reference, Naked Capitalism has had some excellent coverage on this, particularly an article by Lambert Strether, on the enshrining of Absolutist Capitalism. The Trans-Pacific Partnership will effectively criminalize any local control over the land, air, water, and public health and welfare. All Federal, State, and Local laws and ordinances will be held subject to international trade law, as defined by an international tribunal of corporate attorneys appointed by multinational corporations. It will allow multinational corporations to go ANYWHERE in any signatory country, including America, and say, we want to mine, plow, drill, log etc, and if State or Municipality says no, they will sue for profits lost, and win. Legal extortion, for the corporate set. It is unbelievable that Congress is for this, but then Congress has no idea what it is about anymore, except maintaining American empire, and their status in it. If America had any sense of itself anymore other than a consumer paradise, Americans would put every one who votes for this bloody trade pact, to washing public toilets for a decade or more, or some such equivalent. If you think Baltimore is a mess, wait about a decade after TPP passes, and America has been hollowed out even more, it's populace even more economically insecure, preyed upon from every gov/corp/bank angle, with the TPP and TTIP empowering an increasingly untouchable and wealthy Washington and Wall Street elite. If they pass it, at least you can say you stood up and said no. My greenhouse. 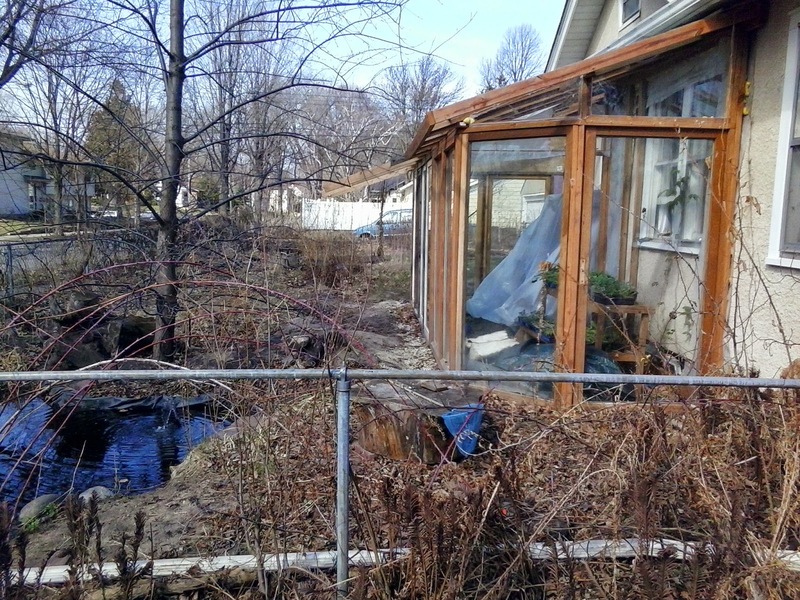 First introduced in my Spring Update post, March 29, 2015; which the City of Minneapolis, Inspections, is calling an illegal addition, because I did not consult the city, not applying for the requisite permits. This was the first stage, started early last spring 2014. The roof and east, south and southeast walls were enclosed with glass, and rigid acrylic, the west wall remained open through the summer. This picture shows distinctly the two different stages (taken yesterday, with the pond foreground, it is early spring with little green growth outside the greenhouse.) The first stage I built with a cedar tone treated lumber, which I paid about $450 for. The second stage frame is reclaimed old-growth Douglas Fir, I removed from a house near Lake of the Isles, when I was in remodelling during the housing bubble, 2004-2007. The glass is mostly reclaimed sliding glass doors, I have collected through Craigslist mostly. The bulk from one job, bartered in exchange for tearing off two layers of siding on a house, and installing some windows and doors. I spent about $1000 to build this. I wish now I had used reclaimed Douglas Fir for the entire frame, as I have enough. A 155 sq ft glass greenhouse for $500 approx? 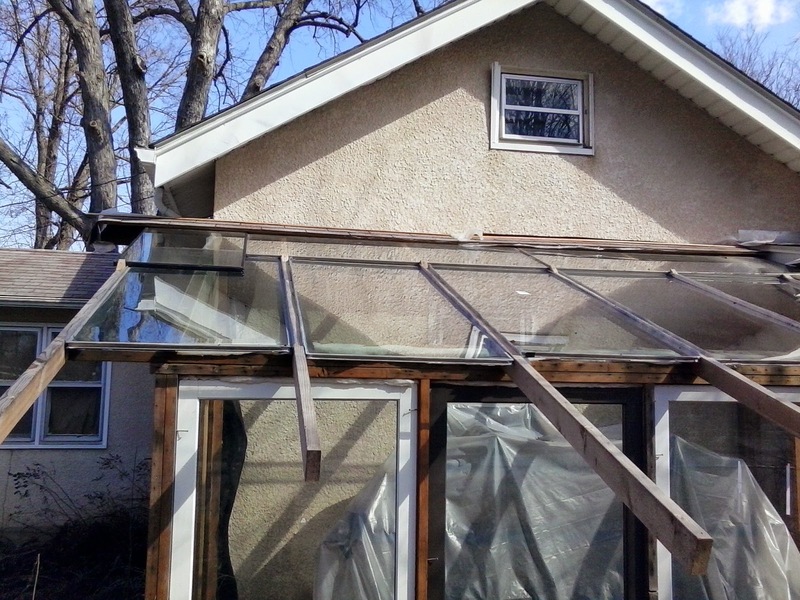 The roof is constructed with 2x4, with a 1/4in spacing between joists, greater than the width of the glass sheets; with 2x2 (or equivalent) screwed to each side of the inner joists, the glass is resting on. 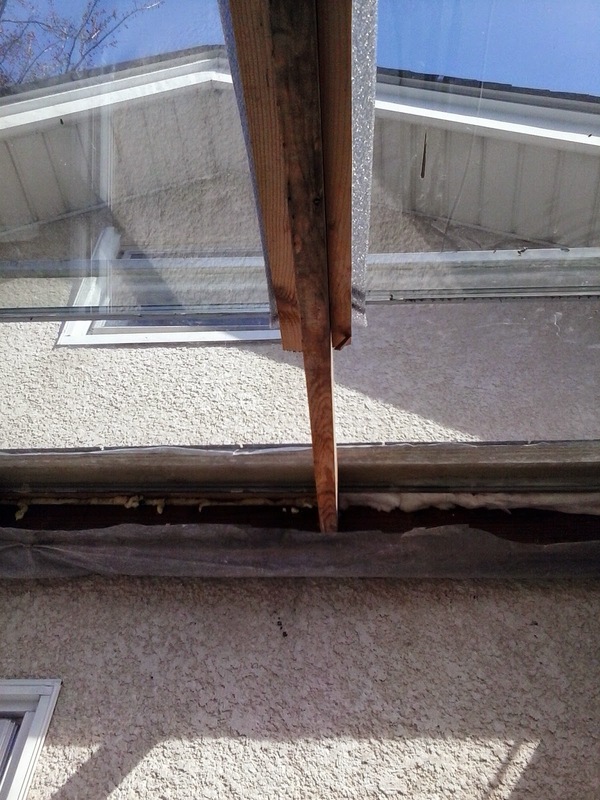 I used carpet tape and foam sill seal as waterproofing, between the glass frame and the joist. The upper level glass is laying horizontally across the joists, overlapping the glass below like a shingle. As you can see, the dimensions are dictated by the glass; that sheet of glass in the upper left (northwest) corner is from a window that had the right width to fill the space, but was longer than the sliding glass sheet next to it. 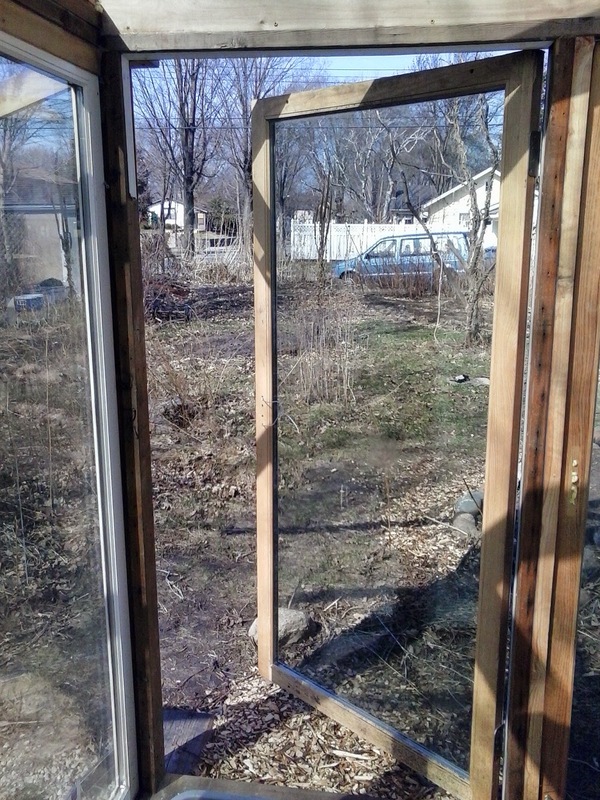 For the walls, I left the sliding glass doors in their frames, inserting them into custom pockets of 2x4 framing (the roof glass, I removed from their frames.) Normally in stick-frame construction, you would rest the joists directly above each wall stud. But because there is a roof overhang on each end, the spacing doesn't match up, dictated as it is by the glass dimensions. No matter, the roof load is not significant, even with heavy snow. The roof pitch is about 22.2 degrees. I would have raised it higher to put less downward stress on the glass, but the angle was mostly dictated by the roof line above the sunroom/front entry. The greenhouse is not attached to the house in any way. It is one separate structure effectively resting against the south face of the house. The door is sliding glass I hung from hinges. 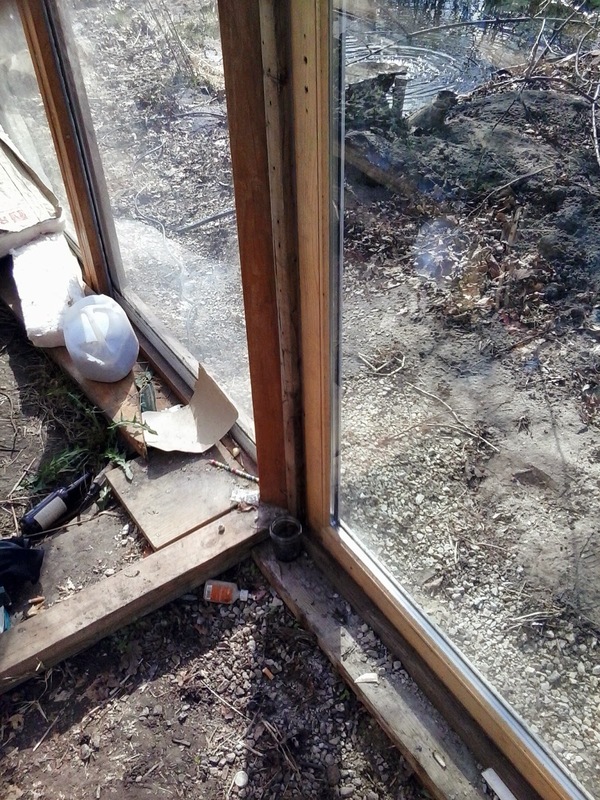 In the winter I will keep it closed, seal it, and enter the greenhouse from the house, through the sunroom. There is about a one inch gap between the roof glass and the top plate. 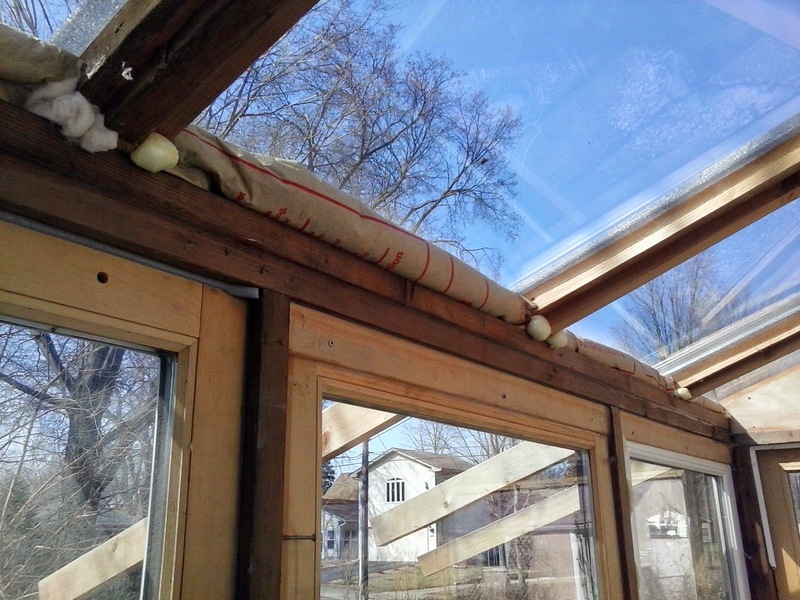 I stuffed battened fiber glass insulation in the gap, which I can remove in the summer for venting. I once criticized (gently) a friend who used blow-in foam insulation in a project of his. Hypocrite. LOL. 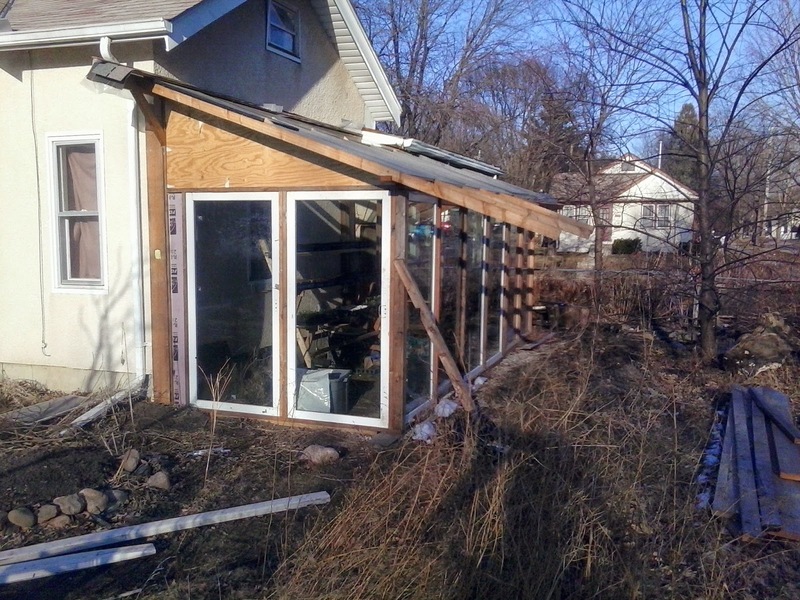 Again, the greenhouse is not attached to the house, by any bolt or screw or strap etc. The gap between the house is filled with more spray foam, and some fiberglass. I filled this west wall upper corner, with plywood on both sides and a rigid foam sheet between, because I thought it would help conserve heat in the winter. 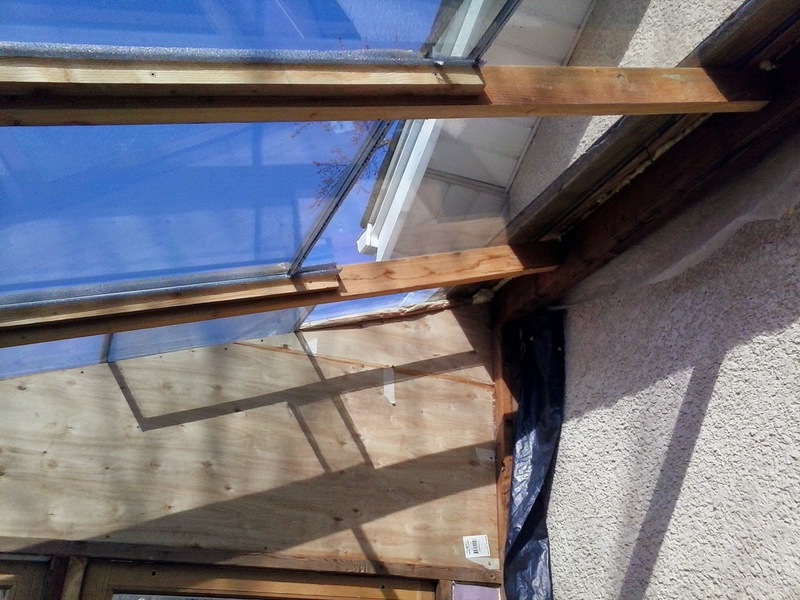 But it also blocks critical late afternoon sun in the spring and fall especially, so I think I will cover it with acrylic or poly-carbonate, and build removable insulating panels I can place there in the evening in the winter. The 2x4 + 2 2x2 joists. At the peak, there is about a 6 inch gap between the glass and the wall of the house. I covered it with two, 12in wide sheets of plywood, covered with shingles, panels I can remove in the summer for venting. Here the two stages of greenhouse come together. I dug a trench 4.5 feet below this, deep enough to insert a 4x8 sheet of 1-1/2in rigid foam, the hole backfilled with a heavy sand mix, with a footing, class-five crushed limestone 2ft deep and 18in to 2 ft wide, the full length of the south face of the greenhouse. Winter Solstice, the sun is just above that chimney. 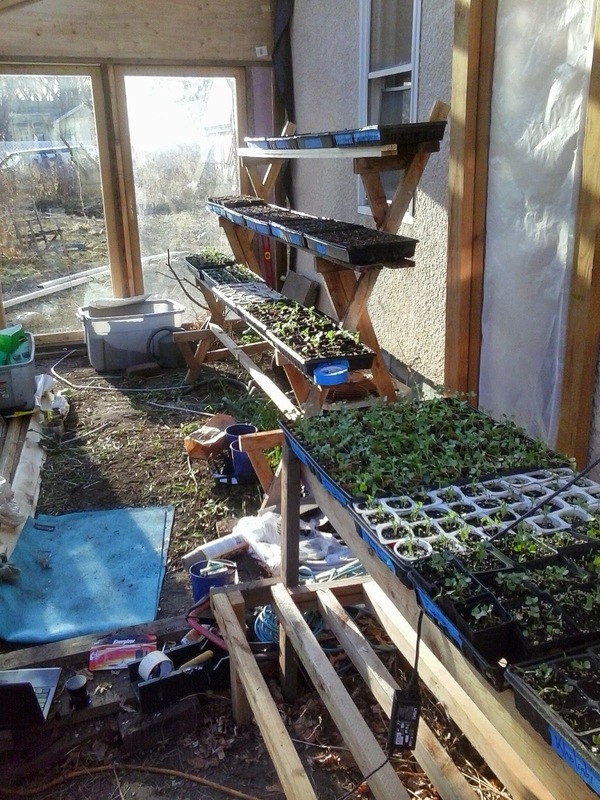 There are too many trees in the way for a proper winter greenhouse, reducing it's efficiency when it needs the sun most. But alas, I am in the city, and can not go about cutting down boulevard trees. As for winter greenhouses for most of my neighbors? The Minneapolis city grid has almost every house in most neighborhoods, in the shadow of it's southern neighbor, most of the winter, spring and fall. From the bedroom. The summer plants, the tomatoes and peppers and eggplant, are enclosed in a greenhouse within a greenhouse. 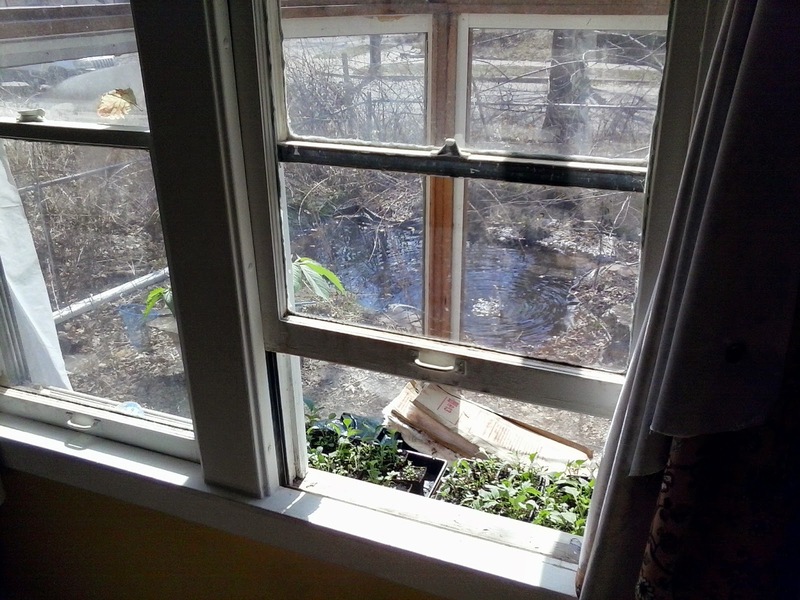 When the day is sunny and above 40 degrees outside, I can leave the windows open and the greenhouse heats the house. Two nights ago I left the windows open, the temperature outside hit a low of 48, the thermostat set at 64, it was 74 at peak and 67 in the morning. It was 75 outside yesterday, with a normal high of 56. 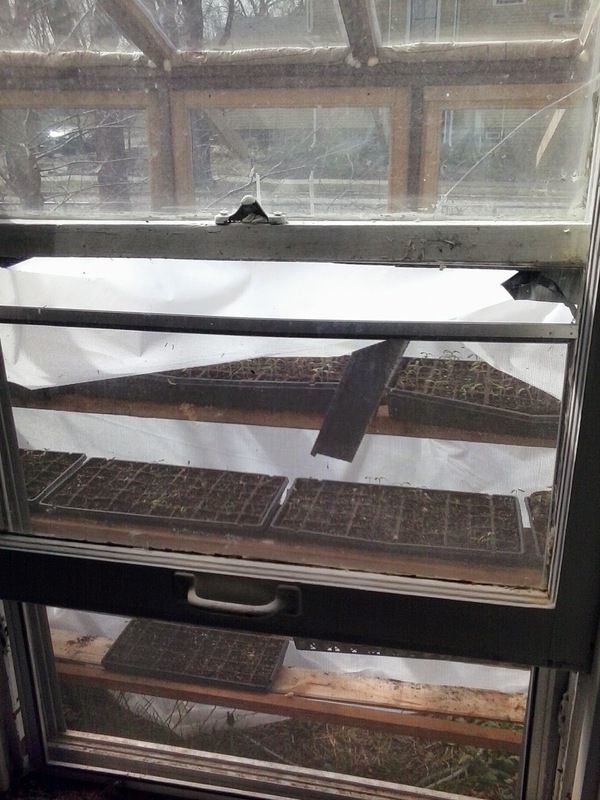 I propped open the greenhouse door much of the afternoon. It peaked at 76 in the house. A thunderstorm rolled through late evening, it was 58 outside at midnight, the windows were open to the greenhouse and it was 73 in the house. This morning it was 46 outside, 67 in the house, with the windows to the greenhouse open all night. 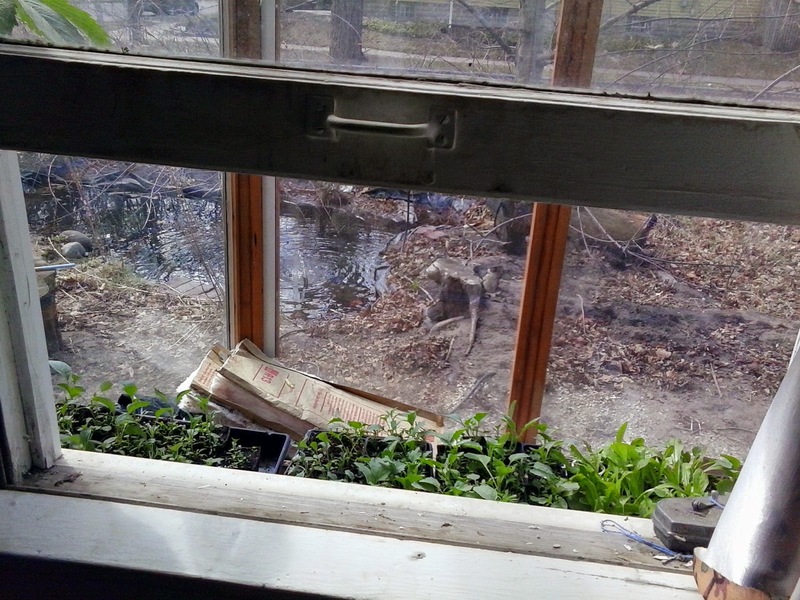 April 13, the greenhouse is considerably greener than the garden. There are plants in the ground in the greenhouse, as tall as they would be, mid-june outside. 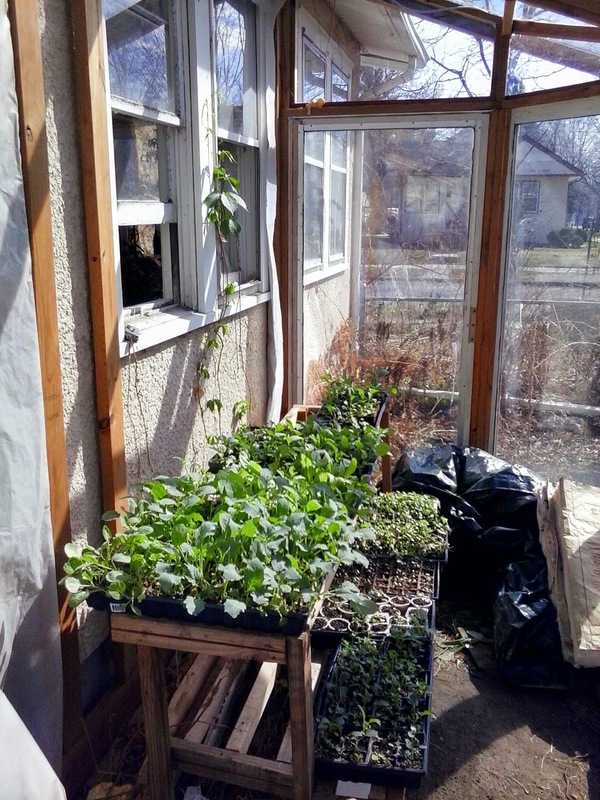 The greenhouse is a work in progress. Many changes to come, of my own design. 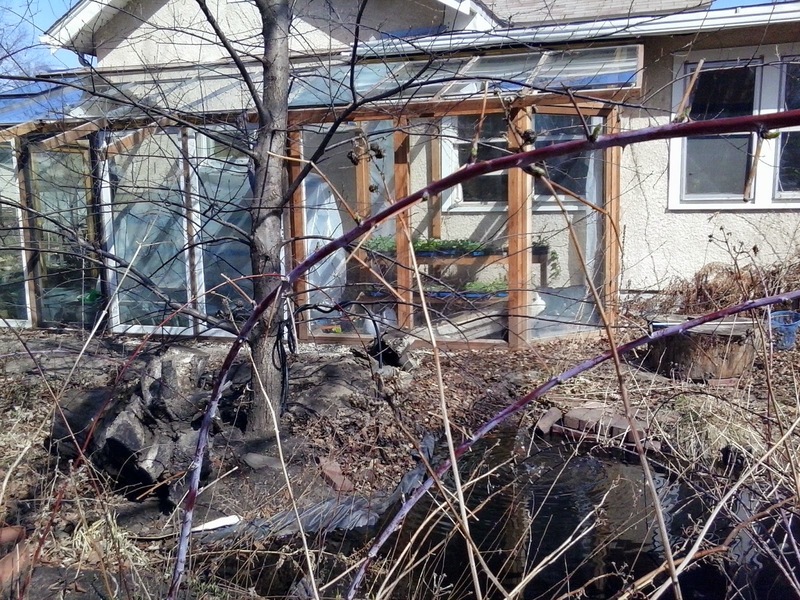 Minneapolis City Inspections has received hundreds, perhaps thousands of complaints about my house, mostly about the garden. They don't hear from the people who walk by and tell me how much they love my garden and greenhouse. April 15 is the deadline to file for a permit. I will go to the City Attorney, Monday, and see what the consequences are for not paying for a permit. The question is, is defying the code more or less costly, than pulling the permit and risking the Inspector requiring an expensive list of unnecessary "fixes"? Sometimes someone says something to me and I see the world differently. Like when a man said to me recently that I could become like Tom Bombadil. The urge is strong, it always has been, to live at the intersection between civilization and wilderness, or what there still is of wilderness in America. The end of the road (in a country where there are roads almost everywhere.) Grow food, build greenhouses and off-grid housing, brew fruits of the garden and wild, spend much of my time in the woods, hunting and foraging, otherwise singing and dancing and enjoying this wondrous earth. I've lived like that before, I grew up in the woods, I miss that, perhaps more than anything about my life in the city. I love my life in the city, but sometimes I do wonder about what I'm doing in the city. This blog seems to have lost the thread of it's genesis. The blog began with the fact that I was living in this house in the summer of 2010, without any of the utilities on, without any money or a job, with an idea about taking the house officially off the grid. There's been little progress on the Off-Grid plans. Mostly since, I have been ranting about this or that, sometimes saying something thoughtful or creative, mostly just evaluating the issues of the day as I saw them, as from a soapbox. I have also written about the gardens, but otherwise I haven't said much about the house, other than some of the details in my on-again, off-again troubles with city bureaucracy. That trouble seems on-again, about that greenhouse I showed you last post. 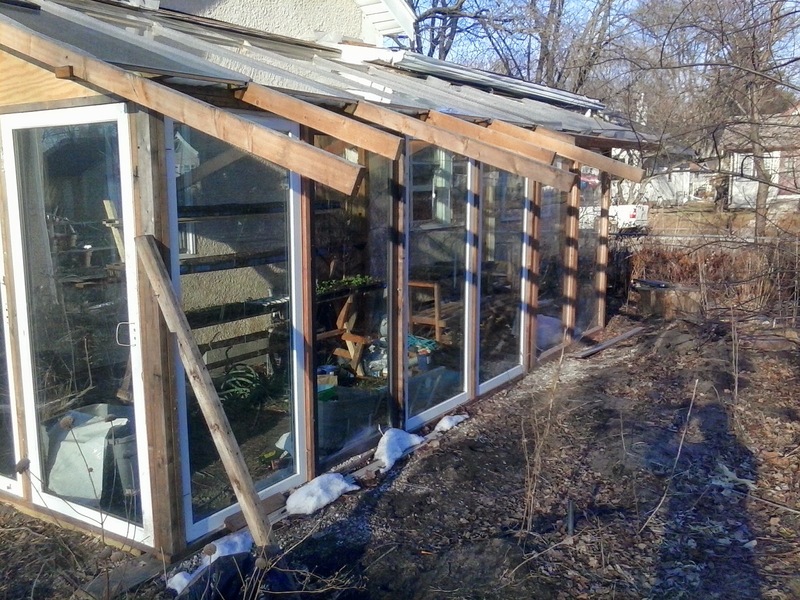 They are saying the greenhouse is an illegal addition, because I didn't apply for a permit. I didn't apply for a permit, because I didn't want to spend the money, and because I wanted to build the thing as inexpensively as possible. 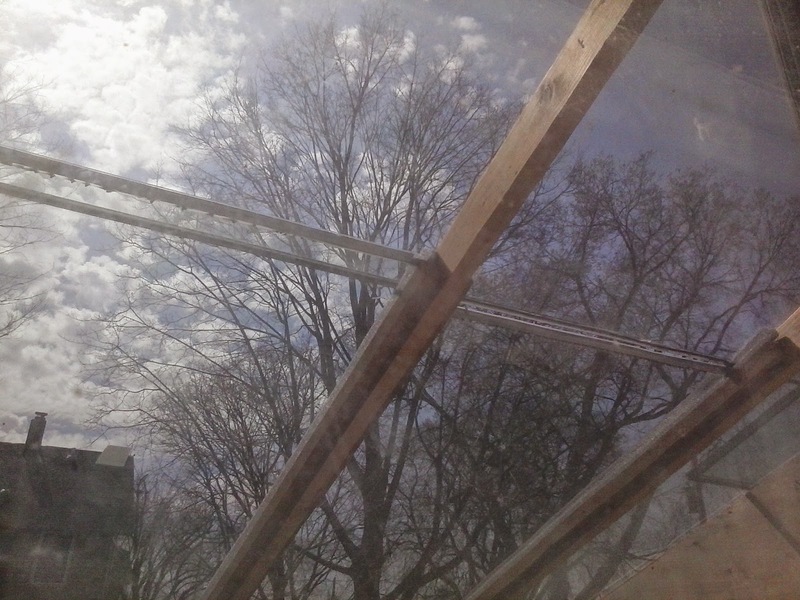 Letting an inspector in is almost certain to inflate the cost considerably; and besides, I don't need an inspector to tell me whether I am capable of building a structurally sound greenhouse. Besides, I have a lot of projects in mind, that I can do inexpensively, most of which would require a permit, some of which projects Inspections would call illegal; I can't afford to pay the city to permit me to make my house stronger, more energy efficient, more comfortable and resilient - not with my underwater mortgage, on my meager salary maintenancing houses for the autistic. There is also the argument, in this age, if I document digitally everything I do to the house, that any pending buyer might consult, or anyone spending time here, what do I need the City to approve it for? That I should have to engage Inspections at all, is somewhat offensive to my spirit. I'm not sure how the City Attorney is going to react to my argument that inspections aren't necessary (probably with a repetitious shield of "it's the code.") I suspect by legal action they mean they are going to assess the Fees to my property taxes, if I don't comply. But then, these days, you never know what kind of treatment you might get from your government; and with a monopoly on power, not a few bureaucrats are drunk with it. Anyway, you might imagine why I am thinking about living somewhere else, far from the city. It's at times like these, I'm grateful for my soapbox. Even if all I have been doing with it lately is posting mostly pithy comments about articles I post on Facebook. Except the context of what was said to me recently, that changed my world, was that I sound like I'm standing on a soapbox. Someone has to do it, I said. But I know what she meant. I don't want to be that guy, standing above, on the corner shouting about what's wrong with the culture, absolutely. There is too much wrong with the culture to do much of anything about it. It will run it's course no matter what I shout about. "Sounds like that guy Duncan has had too much "kool-aid". For a better, more clear definition of "holy war", he should probably join ISIS; they will explain it to him." To which I replied: "LOL, Tuffy. Sing and dance, get drunk, get high if you like (I recommend cannabis as it can chill you out ;) Otherwise, yeah, "kool-aid" - speaking of ISIS, do you mean that thing so much a product of America and Europe's imperious war machine, or what happens anytime you reach such a high population, and can't provide jobs to or even feed the majority of people (and you've been manipulating them with misinformation for generations), or the very dark and hideous shadow of that monotheistic cousin, or the goddess? War is never holy." I don't want to go to war with the City. 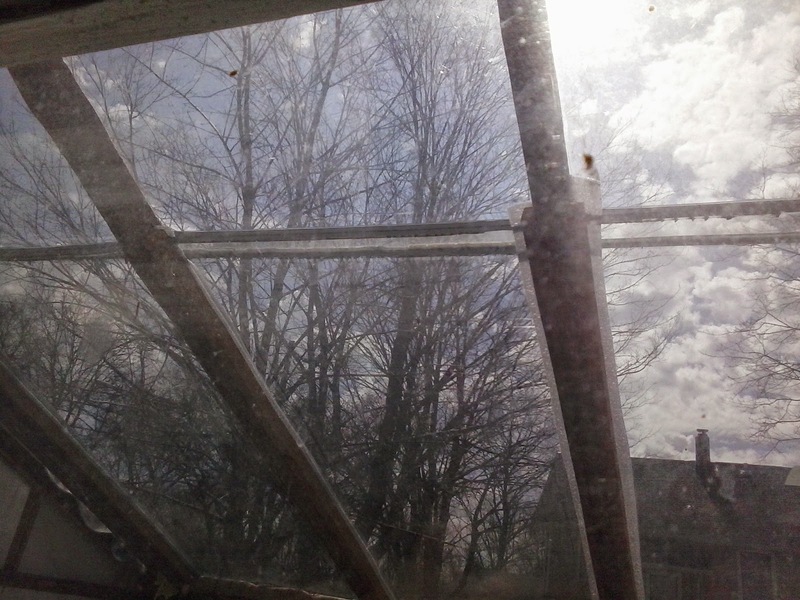 Meanwhile, forthcoming, updates on that; and I will write a little more about the greenhouse, and about the gardens I am building, here and off-site.